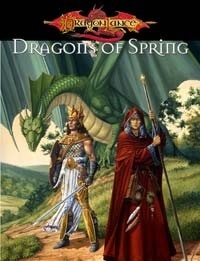 Dragons of Spring Dawning, the concluding episode in the ever-popular Chronicles Trilogy, once again takes listeners on a fantastical journey to Krynn, where friendships are made and lost and destinies finally realized. Armed at last with the powerful dragonlances, the Companions of the Lance lead their people in a final desperate battle against the destructive dragons. Knight and barbarian, warrior and half-eft, dwarf and kender and dark-souled mage -- none has reckoned how high the price of victory -- or even defeat -- might be. One by one, they must each overcome personal doubts and conflicts -- their only hope if they are to stop the return of the five-headed dragon goddess, Takhisis. Listen and discover how truth and virtue at last triumph over the deadly darkness of an all-consuming evil in this dramatic conclusion to one of fantasy's most legendary tales.